This cd-r released in February 2007 by Attack To Society Distro and DIY Label (Turkey/İstanbul) with the help of Atilla and Atican (owners of ATS2 Distro and DIY Label(RIP)).All of cover designs were made by Obstructed and edited by Atican. This cd-r was pressed black carbon cd-r. Get this album from Attack To Society Distro and DIY Label for 2$. Trades and Wholesales are welcome. This Album have 3 different front covers as design but only 1 of them was pressed. 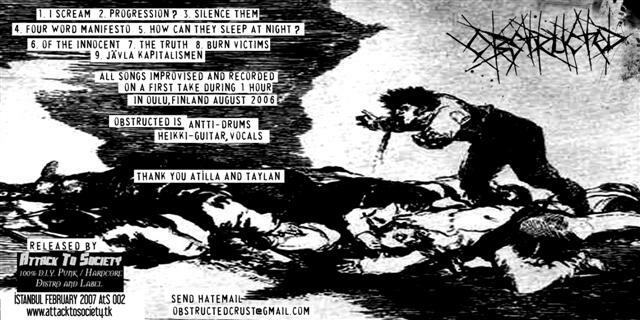 Attention for Distro! : This is a non-profitable D.I.Y. (Do It Yourself) Album. Please sell this item max 3$. Distroların Dikkatine! : Bu Split Album kazanç amaçlı olmayan D.I.Y. (Do It Yourself - Kendin Pişir Kendin Ye) bir üründür. Lütfen bu ürünü maksimum 4 YTL veya karşılı satınız. Please write mail to other wholesale prizes and offers. - Lütfen diğer çoklu alım fiyatları ve teklifler için kontak kurunuz. 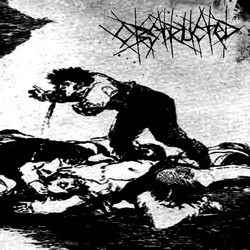 Obstructed is crust punk band from Oulu, Finland and have been together since august 2006. Obstructed are Antti (Drums), Heikki (Guitar - Vocals). An all-improvised drum-guitar/vocals -duo. Formed at the end of august 2006, while recording some other stuff at our bombshelter. 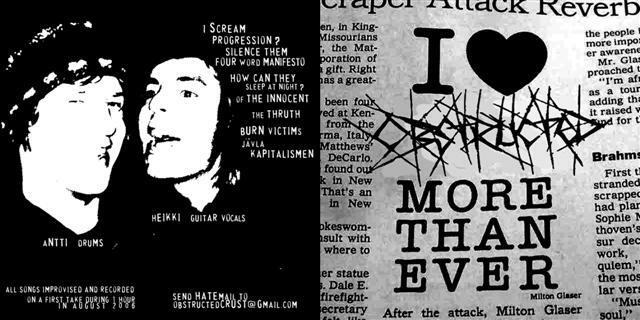 The idea of playing improvised crust we got from the crappy bands, which made us think if its possible to create better songs than they have just by playing whatever riffs comes first in mind, shouting whatever comes to our mind. So we tried and got some stuff recorded. And it was hell of a fun!